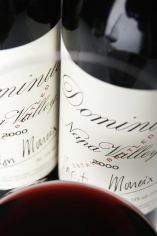 The Wine Advocate - Made in a more masculine style, the 2008 Dominus has all of that along with bigger body and more structure, fat, density and texture. Both are brilliant wines and they represent the finest back-to-back vintages for Dominus since 2001 and 2002 or 1990 and 1991. Both the 2007 and 2008 Dominus should drink well for 25-30 years. Parker - Made in a more masculine style, the 2008 Dominus has all of that along with bigger body and more structure, fat, density and texture. Both are brilliant wines and they represent the finest back-to-back vintages for Dominus since 2001 and 2002 or 1990 and 1991. Both the 2007 and 2008 Dominus should drink well for 25-30 years. 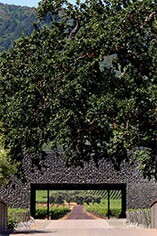 This estate, owned by Christian Moueix, includes the famed Napanook Vineyard that was the base of so many of the historic Inglenook Cabernet Sauvignons of the 1950s and 1960s. Interestingly, they have completely eliminated Merlot from the bottling. The 2007 Dominus is a 5,400-case blend of 94% Cabernet Sauvignon and the rest Cabernet Franc and Petit Verdot. There are 4,200 cases of the 2008 Dominus which is composed of 84% Cabernet Sauvignon, 13% Cabernet Franc and 3% Petit Verdot. Lower yields resulted in a denser, more concentrated wine. The remarkable thing about these cuvees is that they smell like a hypothetical blend of a top Napa Cabernet Sauvignon and a serious Bordeaux, possibly a cross blend of a Pomerol and Pauillac. Both wines possess silky sweet tannins, which is the big difference between Dominus post-1990 and the first seven vintages, where the tannin content was relatively high. About 40% new oak is used in their upbringing.